Looking cheerful despite staging his hunger strike the week summer proper broke in Britain, Idaikader, a councillor in the borough of Harrow, seemed overwhelmed by the large crowd of well wishers who sat beside him on the green outside the Parliament. 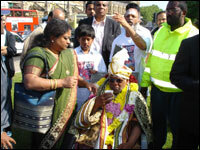 Tamil media persons joined the crowd around him as his wife gave him a drink of water to break his fast. Earlier in the day, Mr. Gareth Thomas, Britain’s minister for international development paid visit and expressed his support for Mr. Idaikader’s efforts. A written appeal by Mr. Idaikaddar to the British government was handed over at the Prime Minister’s residence, 10 Downing street, sources said. Mr. Idaikader, a British citizen, said he would continue to campaign for UK to take active steps to compel Sri Lanka to rein in its military. As you know, the security situation in Sri Lanka, particularly for the people of the Northeast, has been deteriorating rapidly since the shadow war between Army-backed paramilitaries and the Liberation Tigers and Tamil Eelam (LTTE) escalated late last year. Despite the international focus on Sri Lanka due to the Norwegian-facilitated peace process, Sri Lanka’s Sinhala-dominated armed forces are, as always, enjoying total impunity whilst unleashing a campaign of murderous violence, intimidation and terror on the Tamils. 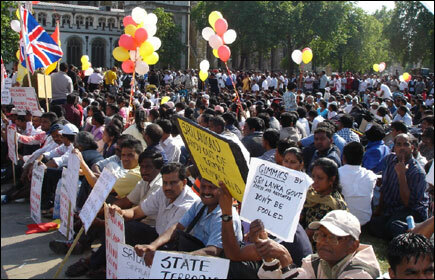 Tamil hopes that the promises given by the government of Sri Lanka (GoSL) during talks with the LTTE in Geneva in February 2006 would be implemented were dashed soon after those negotiations concluded. The killing of a prominent and much-respected community leader who had been nominated to take the seat of Tamil MP Joseph Pararajasingham – himself gunned down at Christmas Mass by a suspected Army-backed paramilitary – triggered a new and even more bloody cycle of violence than before the talks. In particular, Tamil civilians have become the targets of cold-blooded killings and intimidatory practices – cordon and search, mass or arbitrary arrests, assault, etc by Sri Lanka’s armed forces. People have been shot out of hand on the street or have disappeared after being arrested in all five districts of the Tamil homeland. The main international actors – the United States, European Union, Japan and Norway – have last week acknowledged that the situation has deteriorated alarmingly. They have called for specific steps from both the LTTE and GoSL to curtail the violence. However, apart from the vocal admonishments, nothing is being done to actually compel the state of Sri Lanka to honour its moral and legal obligations with respect the rights of the Tamils. In 2003, the Co-Chairs of the donors community said that $4.5bn of aid they were pledging to Sri Lanka would be conditional on ‘progress in the peace process.’ There has been no progress, only a slide back towards war. But the Co-Chairs say they have released over 75% of this pledged aid anyway. The European Union, as a Co-Chair, and the United Kingdom, as a key member of the EU – and as a country with a lengthy history of involvement in the ethnic politics of the island – have both a moral obligation and the capacity to rein in Sri Lanka’s rightwing government and its armed forces. lift the punitive measures imposed on Tamil residents of the Northeast, including bars on fishing and farming, the blockade on fuel and building materials, etc. impose an immediate travel ban on leaders and members of Tamil paramilitary groups listed by the Co-Chairs in the past few weeks as involved in the ‘shadow war’: namely the EPDP, Karuna Group and PLOTE.